Sleep closer to the stars! No pain, no gain! Challenge your mental and physical conditions to reach the highest point in Panama (3447 m above sea level). Experience unforgettables sunset and sunrise at the top of the Volcano! The best ride in Panama! The Boquete valley is a paradise for riders... With stops to stunning viewpoints, tiny rivers and lakes. Swim, Swing , Jump… and Relax! Swing from a vine into the natural pools, jump off rocks, or just relax, take amazing photos and explore the fauna and flora surrounding the waterfall. and explore one of the best hikes in the area. Have fun & Relax! Jump, climb, swim in these unique rock formations. 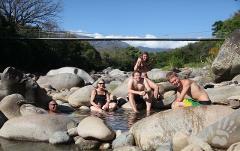 Then, relax in the natural pools (up to 40ºc !) at the Caldera Hot Springs. The perfect day for non-hikers! The best of Boquete in 3 hours! Learn about the history and culture of Boquete. Let our local guide show you the highlights of our charming town as well as the most secret getaways. Discover the local passion! 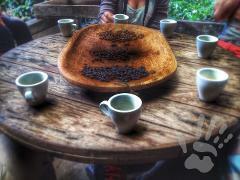 Gain an intimate understanding of how coffee is grown and produced in a small local Finca. Then, enjoy the freshest cup of coffee you’ve ever tasted! Cloud forest & Wildlife Emerse yourself in the dense cloud forest and explore all of its mysteries. On your way, discover 3 spectacular waterfalls. Swimming is possible. Paddle down Cat III+ rapids enjoying adrenaline and the jungle wildlife along this majestic river. Get your adrenaline pumping in a Tropical Paradise and see Boquete from another angle: the canopy! Hike into Wild Beauty One of the most scenic hike in Panama. The best combination of good jungle hiking and observation of tropical wildlife. A local guide is necessary. Take an unique trip to the Chiriqui Gulf to observe the whales in their natural habitat! Each year, between July and November, more than 6,000 humpback whales migrate to the warm waters off the Chiriqui Gulf.. Your best chance to spot Quetzals! A lovely short hike to experience some of the most secret treasures of the region: Rare birds and wonderful tropical bio-diversity. For nature lovers! We offer you a full day Tour of the best activities in Boquete! During an amazing day, you will be able to hike, relax and have a taste of Boquete's culture! We offer you a full day Tour with 3 of the best activities in Boquete! During an amazing day, you will be able to hike, relax and have a taste of Boquete's culture!